We specialize in custom tours designed specifically to your level of physical fitness and your request of trail and overnight accommodations. We also offer Wilderness Expedition trips for return clientèle. Our trips are not tourist oriented. You are an integral part of the team. There will be no warm lodge, hot toddy or someone to take the dogs off your hands at the end of a long day. If you are looking for a luxury type tour please look in the Fairbanks or Anchorage areas. $500.00 per day, per person, $475.00 per person if coming as a team or group. You are not charged for your final day with us in Eagle. Fee includes training in mushing and survival techniques, camping and survival gear, all food, transportation and lodging from the time you arrive at the Eagle airport until you leave. There are no hidden costs. We have winter clothing and boots available and in most cases are able to help outfit you in outer gear with advance notice at no additional charge. 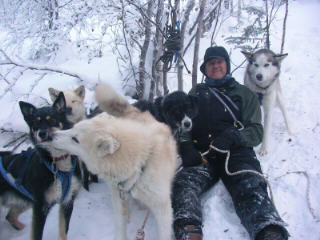 Our Alaska dog sled tours are not tourist oriented; they are the real thing, challenging and physically demanding. When you go on a dog sledding adventure / tour with us you will mush back in time and travel as it was done 100 and more years ago. There will be no snow-machine support, no one going ahead to set things up. You will be an integral part of the whole operation from start to finish. You will be responsible for your dogs, once you have been introduced and shown the ropes. You will harness, un-harness, feed and care for your team once you are out on the trail. You will carry your gear and supplies in your sled. You will be responsible for your own well being, but you will be watched over by an experienced guide who will be there to help and educate you along the way in everything from mushing to wilderness survival techniques. Because we want each person to realize their dreams and a true wilderness setting, we keep your tour one to one, or one to two with your guide...unless you specifically ask for a larger group. Many other kennels have tour dates set up with the possibility of mushing with up to 5 or more other people plus your guides, which can be fun and a party atmosphere however this reduces the quality of your wilderness experience and can be much more hectic with the additional dog teams that are required. Your typical dog sledding tour should run about 7 to 10 days to experience a full and wide variety of trail systems and topographical diversifications that abound in this remote wilderness area of interior Alaska and to allow for training with your team, but can be set at whatever amount of time you prefer. You will begin your training on an established trail system from our homestead with a day or two of day trips to give you the “feel” for what is to come later on when the trails become more challenging. Day trips can vary from 12 to 25 miles. Average daily miles are 20 to 25 miles or 3.5 to 5 hours. Our homestead day trips begin deep in the boreal forest and range onto the Yukon River with a run to the Canadian Border to the East or a run on the Yukon River for as far as you want to the West. Day trip trails can also range into and through several large river drainages, mountain passes and lake crossings including mountain ascents, descents, sheer ice, jumbled ice and different snow conditions which helps to contribute to your novice-training regime. Our American Summit cabin features some of the most incredible views Alaska has to offer with some established trails and “make-your-own” trails. Some years the 40-Mile Caribou herd (of 40,000+) winter right on top of American Summit along with you, your dogs and the wolves. Usually we can turn the average beginning musher from a novice running a well marked established trail to an advanced “dog-musher” running “black diamond courses” in pursuit of the perfect caribou photo in just a couple days of day trips. At this point the real adventure begins. It is an adventure of your choosing. 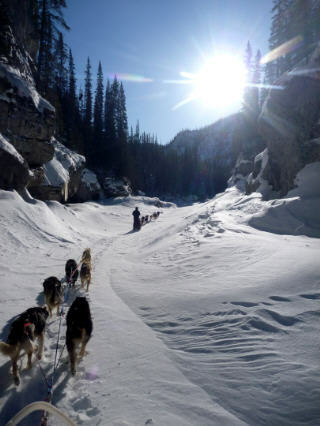 You can run the Yukon Quest trail and overnight at a remote checkpoint cabin or old miner or trap line cabin. Run deep into the glaciated mountain ranges of the “40-Mile” country and overnight in a tent camp/camps. The most challenging and physically demanding tour we have to offer carries you deep into the rugged interior of Alaska. You will travel in country accessible only by dog team so remote that you are guaranteed not to encounter another human for days on end. The overnights range from rustic log cabins in the middle of no-where to a deluxe private cabin with an incredible sauna for one night if that is what you prefer. For the average person, of average physical shape it would only take a couple of days of training and preparation. You are not guaranteed a private trip but there will never be more than 2 clients out with any guide. If you should want to talk to us about a private trip please contact us by e-mail…see our contact page. You can communicate directly with us via U.S. mail, E-mail, pre-arranged telephone conference, etc. after initial contact and then we specifically put together all the details, dates and logistics for your customized tour. Clients begin booking as early as June or before so if you are tied down to specific dates check with us right away to see if the tour is available when you are. Because our tours are customized to meet specific requests from each individual client our physical requirements will vary considerably for each tour or expedition. Because of the very nature of our remote, wilderness location what we might call an easy trail can be in extreme circumstances an intermediate or even advanced trail for 95% of other dog tour businesses. Even a custom tour geared to a beginner requires a decent level of physical fitness. A beginner in good shape can move to intermediate level in just a couple of days...age is not a discriminatory factor. We have friends in their 70's that we would take on tour. If you cannot jog/walk 2 miles in less than half an hour then you should consider a Fairbanks or Anchorage connection for your dog tour. Riding a sled is a physical endeavor. You don't just stand on the runners as you are in constant motion and good balance is a must. You have to be prepared to take falls and they can be hard or easy falls depending on what you fall on. When going up a steep slope you need to be able to step off and if not push the sled up at least jog up behind it while still holding on. This takes some of the weight off the dogs. Expeditions require a much higher level of physical fitness. Expedition clientèle are selected. Many times your fitness level will determine which trail system your guide will take you on. It is important for us to know ahead of time your fitness level and/or limitations...also important to you for your enjoyment of the tour.